Commerce Secretary Ed Gaunch, left, talks with Sen. Corey Palumbo, D-Kanawha, following Gaunch’s appearance before the Senate Finance Committee Monday. A former state senator, Gaunch was named Commerce Secretary in December, about a month after he lost his reelection bid to Sen. Richard Lindsay, D-Kanawha. 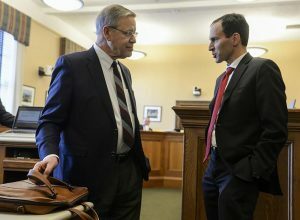 CHARLESTON, W.Va. — In his first time returning to the Senate as West Virginia Commerce secretary, former state senator Ed Gaunch told the Senate Finance Committee on Monday that Gov. Jim Justice wants to make a major investment in the state Tourism Division in the 2019-20 budget. Justice is proposing increasing Tourism funding by $14 million, Gaunch said. Justice also proposed a $14 million increase for Tourism last year, but the Legislature zeroed it out of the final 2018-19 budget, instead providing the Tourism Division with a $2.5 million supplemental appropriation. About $10 million of the $14 million would go for “brand promotion,” which Tourism Commissioner Chelsea Ruby said is a technical term for traditional television, radio and print advertising.